New York City, NY - With the blessing of the First Hierarch of ROCOR, His Eminence Hilarion, Metropolitan of Eastern America and New York, on Saturday the 26th and Sunday the 27th of June, the Kursk Root Icon of the Mother of God visited St. Sava’s Serbian Cathedral in New York on the occasion of Vidovdan, the principal Serbian national holiday and the 621th anniversary of the Battle of Kosovo. The magnificent cathedral was built in 1855 and originally served as an Episcopal church until the 1940’s, when the cathedral was purchased by Serbian immigrants and consecrated in honor of St. Sava of Serbia. St. Sava’s Cathedral is the only Serbian church in New York, and is the center of the Serbian community in New York. On Saturday evening, June 26, diocesan secretary Archpriest Serge Lukianov brought the wonder-working icon to the cathedral. 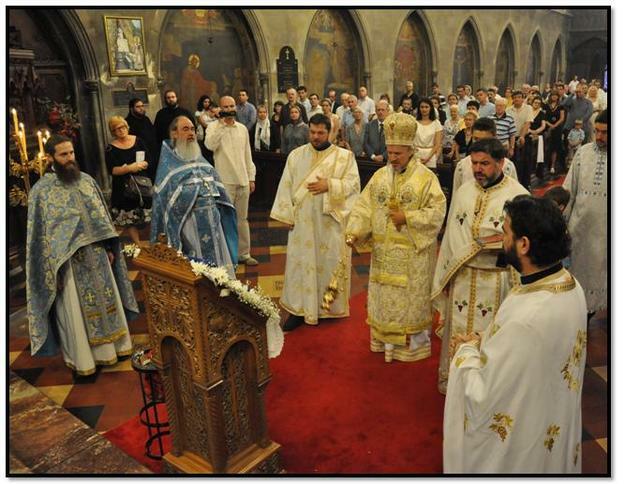 The Great Vespers with akathist were led by the rector, Archpriest Djokan Majstorovic, co-served by Fr. Serge, Archpriest Zoran Radovic (rector of St. George’s Serbian Church in Elizabeth, NJ), Priest Vladislav Radujkovic (cathedral cleric), and Archdeacon Jovan Stanojevic (cleric of the Serbian Patriarchate). The general singing of the akathist before the holy icon was performed in English and Serbian. The following morning, the faithful greeted His Grace, Bishop Mitrophan of Eastern America (Serbian Orthodox Church), after which the Divine Liturgy began. His Grace was co-served by the above-mentioned clergy. Exalted guests were present at the divine service: Their Royal Highnesses, Crown Prince Alexander II, Head of the Serbian Royal House, Heir to the Throne of Yugoslavia, and his spouse, Crown Princess Katherine. The royal couple prayed on the solea during the Divine Liturgy. In addition to Their Highnesses, the following honored guests were also present: the Honorable Branko Radosevic, Consul General of the Republic of Serbia in New York City, and the Honorable Koula Sophianou, Consul General of the Republic of Cyprus in New York City.Upon completion of the Liturgy, Bishop Mitrophan greeted the royal couple, thanking Their Highnesses for celebrating Vidovdan with their countrymen here in America. His Grace also thanked the First Hierarch, Metropolitan Hilarion, for the chance to pray before the wonder-working icon of the Mother of God. In his reply, Fr. Serge greeted His Grace on behalf of the Metropolitan and expressed his sincere gratitude for the warm reception and the prayerful and fraternal bonds with our Serbian brothers and sisters. Fr. Serge underscored the important role played by the Serbian people in the most trying years of the 20th Century, when the Kursk Root Icon was taken abroad and became the guide of the whole Russian Diaspora. He said in part: "Today’s historic first visit of the wonder-working icon to St. Sava’s Cathedral is a sign of the unity of our two peoples in Christ. May the Heavenly Queen help us to continue our co-service and witness to the true faith in the American land." Fr. Serge then passed along the blessing of Metropolitan Hilarion to Crown Prince Alexander and St. Sava’s Cathedral in the form of an exact copy of the Kursk Root Icon of the Mother of God. During the veneration of the Cross, all of the faithful were given small copies of the Kursk icon as a blessing from Metropolitan Hilarion. After the Liturgy, parish school students presented an historic play in the parish center in remembrance of the Battle of Kosovo and the martyric death of St. Lazar the Prince-Martyr. After the presentation, Crown Prince Alexander greeted the children, and tasked their parents with bringing up their progeny in an Orthodox, patriotic spirit, so that they might not forget their history, their culture, and their inheritance. A bountiful luncheon was then offered for all those in attendance.